People hear seaweed and think of algae attached to rocks or they imagine others sitting at water's bottom slippery and less than sublime. Do they know there are seven thousand types of red, brown, purple, and green algae, that they are found at the beach or in the water, and that they are adored by the Chinese? Do they think of them as vegetables of the sea and know these sophisticates use photosynthesis to capture energy from the sun? Do they realize they provide shelter to sea animals? And most importantly from this magazine's perspective, do they realize their Chinese culinary capabilities? Algae are most often collected seaside, but not always. One in the Ceramiaceae family, specifically Polocaria tenax are fronds or strands used by swallows for making what the Chinese call bird's nest. They use these strands made with their saliva and the predigested fronds, at this point called bird's nests, in several ways, the most popular is using them in tonic soups. AGAR-AGAR is another delight. It is made from a sea moss, and it has ever so many uses including culinary and cosmetic. When dry, agar-agar is hard and hardly used, but when soaked or these moss-like algae are found young and moist, used raw and mixed in cold dishes, or cooked with other vegetables. In their original state and botanically called Gracilaria verrucosa, these algae are the major source of agar-agar. They can be eaten with vinegar and soy sauce in their jelly-like state. In cooking, they are a super thickener. They are also used in various facial products to provide the skin with smoothness and moisture retention. As such, they are found in creams, lipsticks, and soaps. In a basement, they might be in paint, and in the garage the may be found in fuel. In cookery, they are used in ice cream and used when manufacturing chocolate milk. As a food, agar-agar is found in packages of fourteen-inch strands or in square ten-inch-long sticks, usually four wrapped together. Sometimes a clear substance, other times pinkish or greenish depending on what the algae fed on or the manufactured mixed in, look for them wrapped in cellophane, and use the sticks or strands after soaking them for half an hour in cool water. Some folks, after soaking them, wring them out and then cut and use them as noodles. You may have had some served mixed with chicken, vinegar, and some light soy sauce. Agar-agar can also be soaked, boiled, and used as a thickener, and mixed with sugar and made into a gelatin dessert. When made this way, the Chinese consume it and believe it a cooling dish. HAIR VEGETABLE is botanically known as Bangia fusco-purpurea. Found dry and looking like matted black hair, it must be soaked before use. Called fa cai, in Chinese, often spelled an older way as fa tsai, this almost tasteless mess of algae absorbs flavors from other foods. It is adored and popular around the Chinese New Year holiday as they believe it brings luck in the coming year. Often used in a dish called Lohan's Delight or jai, this Buddhist vegetarian item, reported in Flavor and Fortune's Volumes 11 and 14, on pages 28 and 13, respectively, can be made with dried oysters during the first two weeks of the New Year; the rest of the year it is usually made one hundred percent vegetarian. In the Fujian province, and throughout most of China, using this vegetable is a popular wish for good things to come. Fujianese particularly like it cooked in an unusual way using the dried fa cai and cutting this into one-inch or two-inch squares. They deep fry them until crisp, and eat them as holiday or celebration snacks. They also use them stir-fried with vegetable, chicken, or seafood dishes. Mostly found along the southern coast of China, in traditional Chinese medicinal item this is recommended for cleansing the gastrointestinal system. In this way, at New Year it is a symbol to clean and start anew. Soaked, then served steamed and seasoned with sugar, salt, wine, and a light chicken stock, people from Guangzhou love it in dishes such as one known as Duck with Hair Seaweed. They also like to use it stir-fried with any number of vegetables. Though these algae can be boiled to form a gelatinous substance and used as a thickening agent, their slippery texture and delicate flavor are, by all of our Chinese friends, reserved for the traditional New Year of Dried Oysters and Hair Seaweed. One year, a friend's family in China sent us home with two pounds for their New York City relatives. It is very expensive in China and they were worried that their brother and his family would not have enough good luck away from their home. 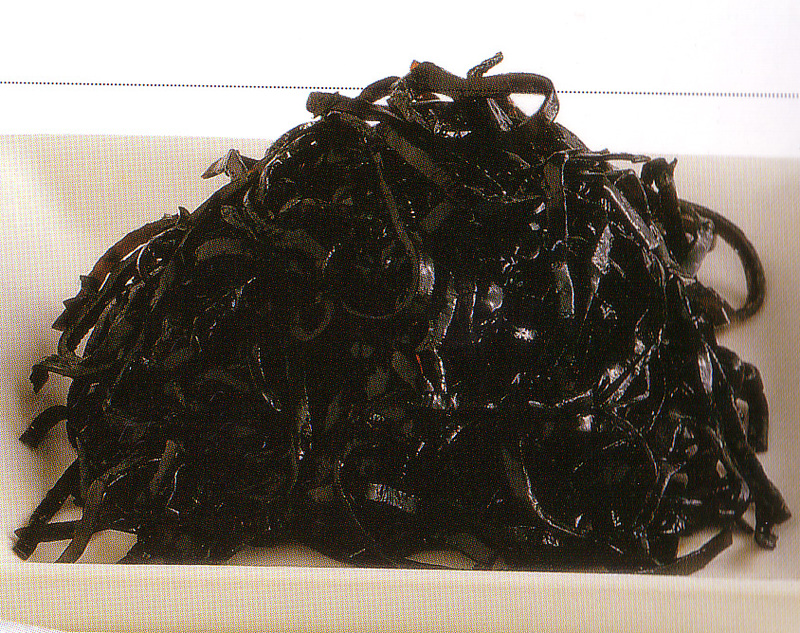 KONBU, a Laminara family food is also known as dried kelp. This olive brown leaf with several different botanical names ranges from five to six inches in width and grows to great lengths. The key to its flavor is the whitish salty covering which, when used fresh, should not be washed nor rinsed. It is loved in stocks by the Taiwanese who, with the Fujianese, use it as a soup base. They and other Southern Chinese soak it briefly and use it saut�ed or in cold dishes. Thin konbu as sheets can be used to wrap meat, fish, and vegetables. Some cut it into sections and add it to soups and casseroles. Medicinally speaking, traditional Chinese practitioners believe that kelp/konbu has cooling properties. However, they also believe too much of it is debilitating. To counteract that property, they recommend preparing it with a lot of fat or oil, both considered warming and wonderful when used this way. SEAWEED SHEETS called 'laver' are used in China. Information about them was first discussed in this magazine's Volume 8(3) on pages 9 and 10, and on page 30. Known as nori in Japan and elsewhere or called laver, these Porphyrua columbina and their relatives including Polyphyrua umbilcalis and Polyphyrua tenera are made into sheets in order to roll foods in them. The sheets or and fresh or processed algae can be minced, and cooked in many dishes. The laver might be red, dark green, or black, and when purchased, those in sheets look like a package of thin crisp pieces of paper. To use them rolled and increase their flavor, toast one at a time, over a gas flame, until very crisp. Then set the food to be rolled on one edge, the sheets quickly soften somewhat making rolling possible. The toasting process brings both flavor and fragrance. These sea vegetables can be used as a snack or added to a batter or a dish. They can also be deep fried and used in soups such as a Cantonese Seaweed Soup. Be inventive, as the Chinese are, use them to wrap cooked and raw foods to eat raw, be ready for the fryer, the soup pot, or the casserole. These and all sea vegetables, as these algae are known, have always been popular in the Chinese culinary. They know they are rich in nutrients, high in iron, and that they contain many B vitamins, and some vitamin A and C. Be aware that their nutrient content, even their sodium content, fluctuates with time of year and place of growth. The Chinese use all algae for many medicinal properties. They believe them popular anthelmintics. Research shows they reduce parasitic intestinal worms, and can be an effective laxative for children. They say they dissolve then swell in the intestinal tract without interfering with nutrient absorption. Chinese health practitioners use one or another to treat goiter, as a cooling agent, cleanse the blood, normalize blood pressure, and rid the body of glandular infection. They also recommend them to treat edema and menstrual problems, and they value their anti-hypertensive, anti-lipid, and anti-coagulant qualities. In addition, these days Traditional Chinese medicine practitioners use various algae extracts when treating cancer, to stimulate the immune system, improve digestion, and detoxify the body. Besides benefitting health, algae provide excellent flavor so Chinese living near sea shores do not purchase theirs, they collect them and use them often in soups, cold dishes, and vegetable and meat dishes. Try the recipes below, others in previous issues, and still others in Chinese cookbooks. 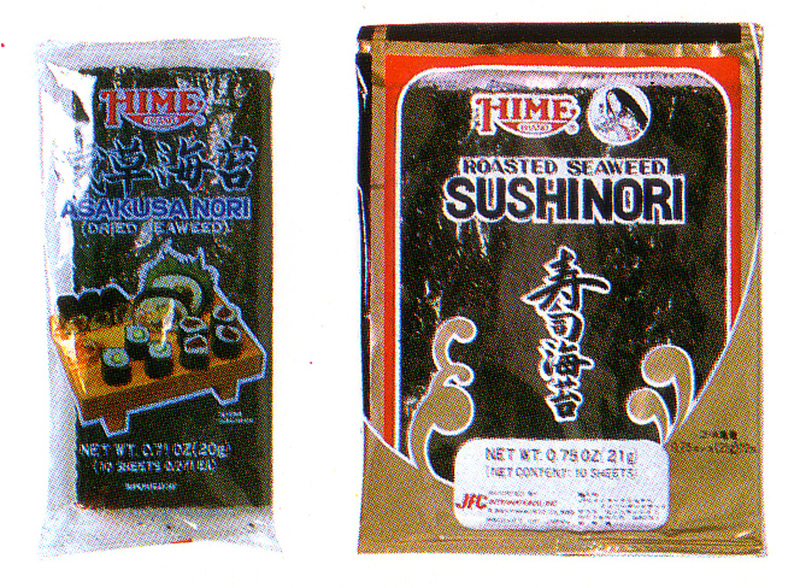 Taste these and other algae treats, and do enjoy them. 1. Sprinkle the agar-agar powder over the coconut milk, add the sugar and simmer for ten minutes. 2. Remove from heat and stir in the coconut cream. Rinse a dish with cold water, then pour this liquid into a dish and allow to set. Cut into diamond shapes or squares. Note: This is quite firm and meant to be picked up with fingers; though chopsticks can be used. 1. Soak the agar-agar strands in cold water for half an hour. 2. Chop two inches off the ends of the chives and mince, then set them aside. Cut the rest of the chives into bite-sized lengths and drop into boiling water for half a minute, drain, and immerse these pieces in ice water. Drain them as soon as they are chilled. 3. Beat the eggs and season them with salt and pepper, then stir in chopped chives. 4. Heat a wok or a heavy fry pan, brush with a little oil, and cook one-quarter of the egg mixture. When barely set, empty the egg onto a plate. Rub the pan lightly with oil before making another. Put each egg sheet on its own plate, and continue until all egg is used. 5. Roll the egg sheets and then cut them into thin strips. 6. Drain the agar-agar and cut it into bite-sized strips. 7. 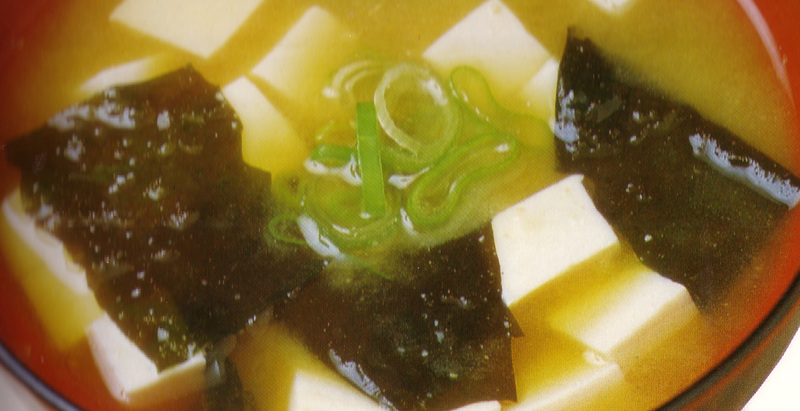 Mix with the eggs and bean sprouts, cover and refrigerate. 8. Whisk together the garlic, sugar, sesame oil, and the honey and pour over the vegetables. Toss and serve. 1. Mix sherry and ginger and set aside. 2. Mix egg and two tablespoons water; beat lightly. 3. Heat soup stock to the boil; add seaweed and stir, then immediately add the sherry and ginger mixture, and stir well. 4. Bring to boil again, then slowly pour in egg and water mixture, stirring, and remove from the heat. 5. Pour into a soup tureen and garnish with the scallions, and serve. 1. Soak kelp thoroughly until swollen and then simmer in boiling water for two minutes. Set aside in the pot it was boiled in for twenty minutes, then take it out and rinse with boiled water; drain and shred. 2. Soak agar-agar until tender, then rinse it with boiled water; drain and section. 3. Cut away tail part of golden mushrooms and rinse them, then scald them in water until tender; take out and drain. 4. In a bowl blend agar-agar, shredded kelp, golden mushroom, shredded carrot, celery, soy, sugar, and oil. Serve sprinkled with sesame oil. Note: To make this a more substantial dish, cold noodles, strips of cooked chicken or slices of smoked bean curd may be added to the above ingredients.